YLEX You can e-mail them at ylex.toiveet@yle.fi or clickety-click here. X3M Fill out the form here. Radio SuomiPOP Fill ot the request form here. Treeball return with their 3rd Full length album Liars In Love. Inspired by the writings of American novelist Richard Yates (The title Liars In Love is taken from a Yates novella), the album is a concept preoccupied with the disintigration of a once loving relationship. Over a series of painfully honest duets, Triani & Astrid Swan trade compliments and insults relating to love lost and it’s cynical repurcussions. ”We decided to make a record that was cohesive in it’s content, focussed on one subject. Richard Yates’ books are full of characters who are quite tragic, who once had a lot going on for themselves, but always seem on the brink of domestic disaster. The voices on Liars In Love are expressing similar feelings” Triani states. Recording for the record started in March 2005 at Pink Noise Studios, with the band taking a different approach than on previous albums. Triani explains,”I wanted to catch the sponteneity of the songs, so we did’nt rehearse tracks prior to going into the studio. We also decided to swap instruments on a lot of songs. I wanted to stay as close to the orginal feelings that the songs were written with, not get lost in detail too much. Loose was something i wanted, no smooth sound. This applied to the lyrics as well. Me and Astrid would often write the lyrics just prior to the vocal takes, so no mannerisms could creep in. Most stuff on the record is first or second take, with no editing”. Mixing for the album was completed in November 2005. 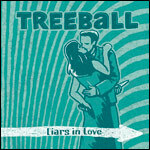 Liars In Love still finds Treeball in love with the 3 minute pop song, but throws in a few extra quirks and suprises. The sound is on the raw side, to capture the emotion of the songs, but this still means there is space for string arrangements, mandolins, timpani drums, glockenspiels and all manner of instrumentation. Following on from the Canadian IPX split release with Aaron Booth on Endearing Records, Liars In Love is the most realised example of Treeball’s music yet. Released through new label Kinkt , 2006 heralds a new chapter for the band, where fans and critics worldwide await their latest offering. Treeball have now finished work on the follow up album to National Treasure. Treeball's 3rd full length album, has been some 8 months in the making, started last March in Pink Noise Studios, Helsinki, recording progressed at home for the remainder of the year. Some 20 songs were recorded during the sessions, and 12 have been selected for the album. Song titles include Cruelty To Animals, Smooth Fruit & I was an Innocent Bystander. The album is a song arc of sung duets about the disintegration of a loving relationship. Treeball have agreed a deal with a new Finnish label (as yet unannounced - watch this space!) and a single release early 2006 will be followed by the album. More details to follow. As well as this, a couple of articles have appeared on Treeball on the net. French blog Rockomondo has a feature on the band here. Spanish page Mira El Pendulo has an article on Treeball from last September. Check it out here. The Hype Machine page now has a bunch of Treeball tracks for you to download in various formats, to go there click here. yet, but there is a forum for you to contact the band. Check it out! The Record Office is selling Treeball's "Cat Formation Of a Mouse" -EP. To buy the Ep anywhere in the world go here. Booth/, Novillero, Treeball etc, etc. Turquoisedays is a very cool web blog that list the best music to be found on the internet's back alleys. Treeball also got a mention lately. Check the site for all the coolest stuff around t'net that you might otherwise not bump into. Just a quick word to let all of you know that the recording of the new album is coming along really nicely and the record will be something for all of you to really look into. Pink Noise Studios, Helsinki. Basic tracks for 19 new songs were recorded, with further recording going on through April & May. Go check the Music section - you can now watch the whole 'Monkeys' video there! After an exhausting year (National Treasure came out, IPX4 was released, a joint tour of Finland and Canada was done with Aaron Booth) Treeball are trying to keep 2005 even busier. They enter the studio in mid-March to start work on their 3rd full length album. Tentatively titled "Liars In Love", as well as the usual songs from Triani, Astrid contributes a couple, Janne Powder a couple and there's even going to be one from Michael. To not let him feel left out, Aleksi may be flexing his guitar muscles on the next album. We'll keep you updated on who's releasing the next record as we look at the options. If you want to know what the Canadian tour looked like, you can check Michael's own online photoalbum here; if you wanted to know what the 2nd gig of the tour looked like at the Dogbus event, look here; and you can check some pictures from Aaron Booth's tour of Finland with Treeball here. It seems since the Canadian trip, there has been a hell of a lot more interest in the band, especially on the net, where bloggers have been spreading the Treeball gospel (thanx!!). This all started with website 3hive who wrote a great review and linked 3 tracks of ours to download as mp3's. In turn this put us on the iPod Lounge, and amongst others Reallyrather, Sixeyes, 8x7org and Musicmobs. In fact, we're on so many blogs that we made the blogsnow list! You can purchase the full discography from the links on this page. Treeball on the web: Rockomondo has Treeball, Mummypowder & Astrid Swan on their setlist. The Dutch page VPRO, has Monkeys by Treeball at 10 on their list and a review in Dutch. Dr Beeper picks National Treasure as one of his albums of 2004. "Not Happy Now" from IPX4 is #30 in Onechord.net's songs of the year list and National Treasure is #9 on Indiepopmusic.tk albums of the year list. And finally, you can hear an interview with Treeball from Radio Helsinki here. 28 Sep 2004 IPX released in Japan Intercontinental Pop Exchange No. 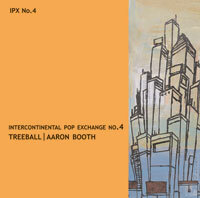 4 with Treeball and Aaron Booth is being released in Japan by Quince Records. The release is being promoted by Aaron Booth who'll tour Japan before touring Canada with Treeball in the end of October. 19 Sep 2004 Treeball skateboard soundtrack Melodica Skateboards have released a skateboard documentary DVD called Bird Song whose soundtrack includes "Let Me Go" from Treeball's 2003 "Cat Formation of a Mouse" -EP and the 2004 video for "Monkeys", directed by Sam Shingler. Other artists on the DVD include Mummypowder, Mutants and Mekhanist. 14 Sep 2004 Intercontinental Pop Exchange No. 4 released! The long-awaited Intercontinental Pop Exchange No. 4 with Treeball and Aaron Booth was released today by Canadian record label Endearing Records. Buy it here! 23 Aug 2004 Canada angle Its official release still three weeks away, the Calgary radio station CJSW have already listed the IPX 4 on its rock chart at #24. Treeball will be touring around Toronto with Aaron Booth in October 2004. Dates will be announced later! 26 Jul 2004 Intercontinental Pop Exchange No. 4 Canada's Endearing Records have just released the latest addition to their marvellous Intercontinental Pop Exchange series, featuring two previously unreleased Treeball songs, "Not Happy Now" and "This is Round", as well as the previously released "Blue" and "Friday Night", taken from the first two Treeball albums. Also included on the CD is Treeball's video for "Monkeys" from their latest album. The other half of the IPX4 CD is taken by an extraordinary Canadian artist Aaron Booth, whose latest album, "Our Last Escape", recently made it to the Canadian charts, and with whom Treeball will be touring in Canada and in Finland later this year. Keep checking these pages for more info for tour dates later! The Intercontinental Pop Exchange No. 4 CD is conveniently available for online purchase for a measly USD8 (!) here. 21 Jul 2004 Let's Make Some Noise There's an enlightening Treeball interview (in Finnish) at www.letsmakesomenoise.com. 24 May 2004 iTMS Treeball's debut album, "The Strawberry Blonde School of Class", is now available through Apple's iTunes Music Store. You can get the whole album in a digital form for $9.99, or $0.99 per song. The service currently only works in the U.S., but is said to be on its way to Europe during 2004. 04 Apr 2004 "MONKEYS" - THE VIDEO The first Treeball video, "Monkeys", is now finished and will be shown in Levyraati (MTV3) later this month. The video was directed by Sam Shingler, the man behind Montevideo and The Pansies. 31 Mar 2004 THE ORCHARD The first Treeball album, "The Strawberry Blonde School of Class", is now also available through The Orchard. The Orchard is the largest distributor of independent music in the world. 25 Feb 2004 NATIONAL TREASURE The second Treeball album, "National Treasure", was released today. (Initial reactions here!) Official release party takes place at Loose (Fredrikinkatu, Helsinki) on tuesday, 2nd March. We have a very special DJ guest: lead singer of the Weeping Willows (SE), Magnus Carlsson, will take care of turning the vinyl for us. Something you won't want to miss. See you all there! 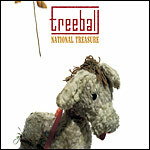 14 Feb 2004 NEW ALBUM Treeball release their second album "National Treasure" on Stupido Records, 25th Feb 2004. Continuing on from the literate pop music of debut album "The Strawberry Blonde School of Class" (2002), the National Treasure album was recorded in two weeks last August (2003) and mixed the following October. The new album presents a more focused Treeball, showcasing the more polished pop aspects of their debut album mixed with a more eccentric sense of lyrical and musical adventure. 14 Feb 2004 "NATIONAL TREASURE" TOUR A joint tour with fellow tunesmiths Red Carpet and Mummypowder is planned for the spring of this year. The late summer (August), sees a split Treeball ep release with Canadian label Endearing Records, featuring Canadian singer songwriter Aaron Booth. A joint tour is planned for Autumn in Canada and the UK. 14 Oct 2003 NEW EP "A Cat Formation of a Mouse"-EP is due in October through the glorious Rhythm Barrel Records (Rollstons, Red Carpet, Boomhauer) and reveals on record (vinyl 7") four new Treeball recordings. The EP was recorded earlier this year and has a rougher (if possible) sound than their debut album "The Strawberry Blonde School of Class". The EP also features a new Treeball member, Michael McDonald, from North Carolina on guitar. Michael has been playing with the band for a year now has fitted in snugly. The EP features three new Treeball songs and a cover version, so buy it now. Available from the usual cool recording outlets. 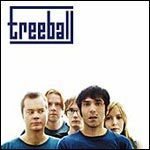 14 Oct 2003 NEW ALBUM Treeball have been busy recording a new album. Work began in July and was finished in August. 15 new songs were mostly recorded at Triani's and Astrid's apartment. Mixing will take place on the second last week of October. The album has a more cohesive sound than the debut and it will be released on the legendary Stupido Records in February 2004 and carries a working title of "National Treasure". Two tracks from the recordings will be released on a split EP by Canadian label Endearing Records sometime in the New Year. 14 Oct 2003 GIGS To coincide with the new album, Treeball are planning an indie-super-tour alongside Mummypowder and Red Carpet. Expect some press on this in the near future. TRIANI: As well as his radio show 8 1/2 on Radio Helsinki every Thursday, Triani has been recording and producing various bands including Silvio, Sister Flo, Mummypowder, Lost Soul Division and Giant Robot. These recordings will see the light of day sometime next year. JANNE POWDER: On top of sticks duty for Treeball, Janne has also released an almost solo Mummypowder album, "V. Strange" on Rubato Music. Past months have been spent working on the follow-up to this critically acclaimed album, and the new band album will be out in the new year bearing the title "Consternation! Uproar!" ASTRID SWAN: Astrid has been working on her own new material, as well as supplying songs for the new Treeball album. She has assembled an all-star backing band; expect gigs and recordings, under her own name, in 2004. ALEKSI M: Aleksi has popped up on various records this year, Tuure Kilpeläinen and Latebirds albums, and has also been recording and playing shows with Mummypowder. MICHAEL M: Treeball's newest recruit, Michael, has been playing with two other bands, Montevideo (Sam Shingler's post Pansies band), and solo artist Aleksi Ojala. As well as appearing on Mummypowder's "V. Strange", Michael has also been writing and recording his own solo material. 29 Aug 2002 RUMBA 16/02: Treeball interview and "The Strawberry Blonde School of Class"-album review. 21 Aug 2002 DEBUT ALBUM Treeball's debut album "The Strawberry Blonde School of Class" release party was at Stupido Club, Bar Alahuone. You can read a review of the gig www.desibeli.net. The album will be available in stores on August 30th, 2002 - best to start lining up now to get a copy!